This modification will make every single one of your threads more relevant and robust to Google and of course those smaller search engines. This modification will insert 5 links at the bottom of each thread are similar to the contents of that particular thread. Internal linking between threads is crucial to developing a dynamic Search Engine Optimized Website. Your threads will all become higher in value by sending visitors to related pages and by pointing relevant Google Bots to them. All the modifications we create we use on our massively online gaming website and this has directly effected our traffic in a positive way. Its’ difficult to measure how much, but we believe, tremendously. Furthermore, it works with other plugins and modifications. At the bottom is the modification in action: “Related News,” can be changed to anything. 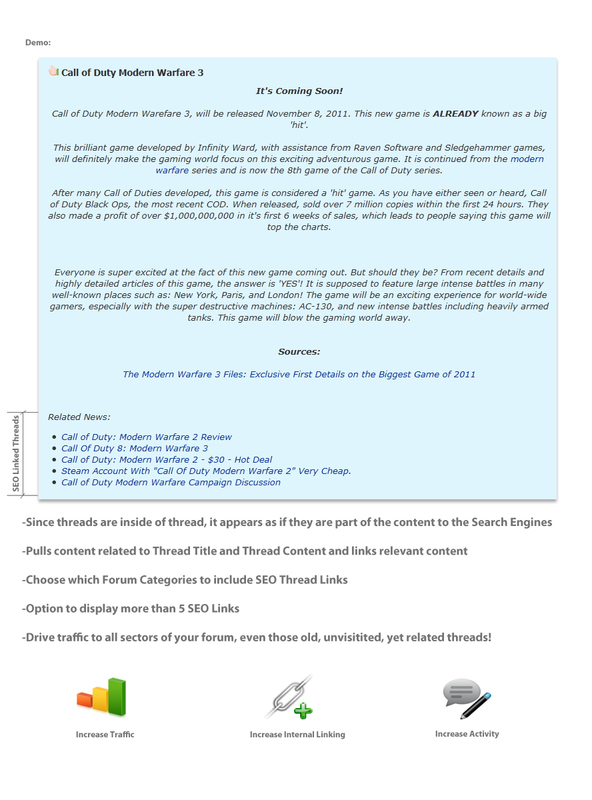 Furthermore, you can increase the number of SEO links in each thread. Notice all the keywords that are being linked in each and every thread. Q: For some reason I cannot get the SEO Linked Threads to work properly. They just dont appear in my threads. Do you know of any plugins that are not compatible with SEO linked threads or any other issues that would prevent it from working? Thank you for your time. Love the mods.